Anton Walter (1752-1826) was an important and highly successful Viennese instrument builder. During the 1780’s he set himself up in Vienna as an organ and instrument maker and was soon granted by King Leopold II the title “Imperial Royal Chamber Organ Builder and Instrument Maker”. Four of his pianofortes were supplied to the Royal Court. By 1804 there were twenty instrument makers working for him. Walter was highly productive and made around a thousand instruments, yet only forty have survived. 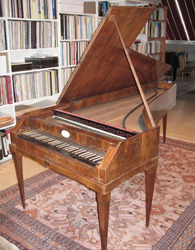 The last surviving Walter piano is dated 1825. The instruments are often used today as models for the construction of authentic copies. By improving the Viennese pianoforte action, Walter managed to build instruments with a slightly more powerful sound than that of his competitors. Typical of Viennese instruments, the head of the hammer is closer to the player than the hinge, and the hammer is made to rise when its short opposite end is caught on a hook. Like all early pianos, those of the Viennese school were of far lighter construction than modern instruments and had a quite distinct sound. Walter was a friend of Wolfgang Amadeus Mozart who owned one of his instruments and often used it in concerts. The original instrument, purchased by Mozart in 1782, is kept in Mozart's birth home in Salzburg. However, the instrument was modified in 1800 by Walter, and probably the hand stop (at key level) was replaced by the more modern knee lever (equivalent to the damper pedal). The preserved instrument thus cannot be fully regarded as the original that Mozart used during his lifetime. Among others who often praised the solid quality was Ludwig van Beethoven who had a Walter in his piano collection. A very young Carl Czerny had piano lessons at Beethoven’s home, and he recalled Beethoven's Walter piano there.